Is it ever all right to lose the deep squat? Stuart McGill discusses the reality that many people don’t have the hip anatomy to keep it. Let’s start with a question you may have heard before: Is it ever all right to lose the deep squat? I’m going to argue now that the deep squat is primarily governed by genetics. 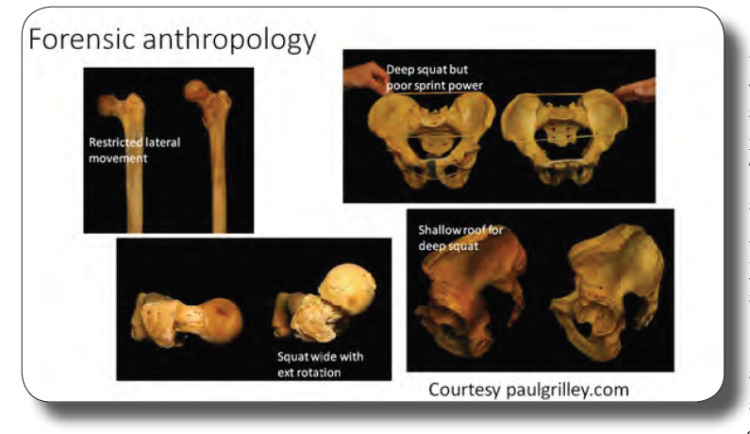 Shallow hip sockets are genetic and predispose hip dysplasia, but they also facilitate a deep squat. The highest rate of hip dysplasia in the world is in Poland. It may not surprise you that the great Olympic lifters come from Poland, Bulgaria and the Ukraine. Hip surgeons call it the Dalmatian hip. They sure as hell don’t come from Scotland because if you look at the Celtic populations, they have very deep hip sockets. While a great advantage for walking, standing and rotational power, deep hip sockets are terrible at producing power at the bottom of the deep squat. Years ago when I was called as an expert witness on two different murder cases, one of my scientific colleagues was a forensic anthropologist. She was an expert in identifying the origin of the body without hair or skin, for example if it had all been burned off. She could observe features of the shoulders, the spine or the hips and know where from in the world the individual came. I would look at the same images and my eye went immediately to function. If you look at the hip anatomy on the left, it will not play in the NBA that’s dominated by a lateral shuffle. That hip anatomy won’t lateral shuffle. It might be a sagittal-plane mover. Look where I’ve aligned the femoral condyle at the knee here and the variation. This person may very well be able to squat wide and get deep as a powerlifter. The Sumo squat style might perfectly fit that person, but it will kill the person on the left. That person is going to have an awfully ugly squat. Let’s align the pelvic bowls and you’ll see the acetabulums. They’re arranged to squat deep and allow the rotation out the front, but I can probably tell you that person will not be an Olympic sprinter where the power is required out the extensor range. We can see in the sagittal plane, as well as a much shallower hip socket. There was a paper I read on the airplane coming here. I think it was in the Journal of Orthopaedic Research or maybe it was Bone and Joint Surgery, documenting how the roof of the acetabulum, common in the Celts and the French populations, now have the highest rate of femoral impingement following yoga. In many cases, the failure of an individual to deep squat cannot be corrected. Interested in more from Stuart McGill, Gray Cook and Craig Liebenson?